A laptop has become a necessity for most students who are past the elementary school. However, considering the cost of education, especially at the university level, students often cannot fit into their budgets top-of-the line laptops. The good news is that it is possible to find capable devices that meet students needs for $700 or less. When looking around for laptops, it is easy to be swayed by specifications: how much RAM is included; how well does the CPU benchmark. However, those things don’t always matter as much as, for example, physical attributes of a laptop. There is definitely minimum “power” that a laptop needs to have to provide enjoyable daily use. Fortunately, most students don’t run applications that require the best CPU and GPU. 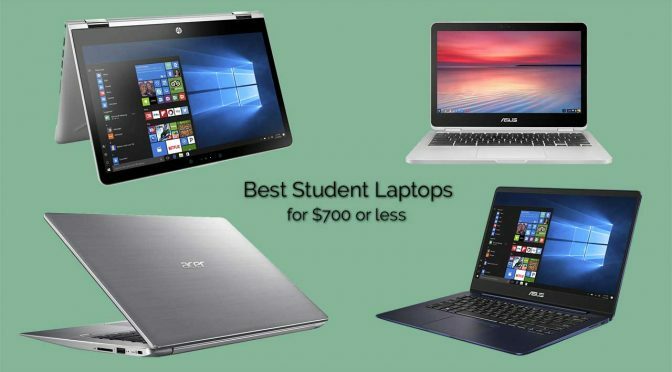 So, as long as one knows what to value in a student’s computer, $700 can be enough to get a well-performing and enjoyable-to-use laptop. We find that keyboards for devices with screen sizes of 10″ or about there (for example, the new Surface Go) are too small for comfortable typing. Therefore, we do not recommend any of these laptops, tablets or 2in1s. For smooth performance, a Windows 10 laptop needs 8 GB of RAM these days. The Chrome OS is a bit less demanding. Therefore, Chromebooks can run well on 4GB, and so we’ve included those in our recommendations. Please note that the three Windows laptops feature the Intel i5-8250U processor. The Intel i7-8250U CPU is another option, but notebooks with this top-of-the-line CPU will for sure cost more than $700. When you compare the cost to performance, the i5 version is a better choice, which is why all of our Windows laptops feature it. Also, you might come across versions of these laptops with older Intel CPUs. We recommend that you stick to the 8th generation, because it offers a significant improvement over the 7th generation and earlier processors. So, you should look for CPUs that start with i5-8 or i7-8. The regular price of the HP Pavilion x360 is $729.99 but finding a sale at $699.99 or less is not difficult. Best Buy, for example, right now offers a $100 discount to students as part of their back-to-school promotion. The regular price of the Asus ZenBook UX330UA is $749.99 but if you shop around, you’ll usually find it within our budget of $700. it has a larger screen (14″), but it is also the heaviest one of the five recommended notebooks. Nevertheless, it’s still a portable machine! If you are not familiar with Chromebooks, these devices do not run the Windows operating system. Therefore, if a student requires an application that runs only on a Windows (or Mac) machine, then the Chromebook is not for him/her. However, these days many productivity tools are delivered in a browser (as web apps). So, most of the time a browser is all we need. In addition to the browser-based web apps, Chromebooks can run Android apps (which count in the millions). In addition, Google is adding support for Linux applications, so soon Chromebook users will be able to take advantage of desktop apps similar to (or the same) as what is available on Windows 10 and Mac OS. So, as a productivity tool, Chromebooks are a great option. The fact that they are often priced lower than Windows machines (and much lower than Apple devices) makes them a great buy for those looking for value. Another strength of Chromebooks is their security and simplicity of use. You don’t need to know much about computers to use a Chromebook – apps are easy to install; and the operating system is updated and managed automatically. Also, a Chromebook doesn’t require any maintenance – like scanning for viruses; fixing system crashes. So, while on Windows (and Mac and Linux), you spend a good part of your time fixing your system, on Chromebook you just do your work. Previous PostIntel Optane Memory – Deceptive Marketing?